With a clear vision to "Connect the Nation", Ogero has made great strides this year thanks to the efforts deployed to improve Lebanon's infrastructure and enable growth in the country. Speaking to Telecom Review, Imad Kreidieh, director general and chairman of Ogero, declared that the Lebanese people will feel the immediate impact of the improvements undertaken by Ogero to put in a place a solid fiber infrastructure which will pave the way towards FTTC and FTTH deployment. 2017 has been a year of achievements for Ogero. Can you highlight the most important ones? What were the maximum internet speed and capacity achieved throughout the year? The achievements of 2017 were, in many cases, the cornerstones of even larger achievements, which will be felt concretely by the people starting 2018. In line with the promise to maintain full transparency and constant communication with the people, we launched his first live interview on social media, dedicating his first appearance to the Lebanese youth and taking all their questions while revealing his upcoming mission and vision for the industry. As a first test to the capacity of the infrastructure, the team and the people's feedback, Ogero launched a series of open speed days dubbed "Unleash the Speed". During this exercise, a total of 35 Lebanese regions were upgraded for one day, covering a total of 62% of subscribers who contributed through different channels in testing speeds reaching up to 12Mbps. Continuing its concrete steps towards a solid network upgrade, the team at Ogero adopted the layered data transport infrastructure (DWDM & IPMPLS). This action resulted in higher and more stable throughput to users across the country. After numerous years of poor maintenance, Ogero's team embarked on a mission to rehabilitate all phone booths across the country while raising awareness on the importance of preserving these public properties that are still used by a wide number of citizens. After the big success of the Unleash the Speed test days, and under the guidance of the Ministry of Telecoms, Ogero put into action the new fees and speeds decree which allowed subscribers to switch to a wide array of new packages with unlimited speed and slashed prices. In its effort to test all technologies available in order to match the needs and expectations of all Lebanese citizens, Ogero launched its first G.FAST project at ABC Verdun, equipping Audi Bank with speeds trespassing the 600Mbps mark. Such speed would allow for a seamless smart ITM experience for remote banking and live teller high definition support. As a first milestone in deploying fiber optic across the nation, Beit Misk's residential project was equipped with high speeds through fiber to the home connectivity. Beit Misk was also set to be the foundation of the first smart city in Lebanon as residents got the chance to test out a smart dashboard, and a smart chat bot, allowing them to monitor and control the environment they live, work and play in. The upgrade of the national network infrastructure was also coupled with the upgrade of the international capacity on Cadmos/Alexandros marine cable reaching an aggregated capacity on all cables of 4.2TB. While fiber to the home was being deployed in major cities, other regions will not be deprived from the international standard speeds they deserved. Starting with that end in mind, fiber to the cabinet pilot project was launched in Khaldeh and Sahel Alma, to be replicated in all other similar regions in the coming months further contributing to the minimum 50 Mbps across Lebanon target. Basing itself on its success in the Beit Misk high speed smart city, Ogero embarked on its next leap in connecting the nation. This leap consisted of equipping the areas of Hamra and Achrafieh with fiber to the home connectivity which will transport all subscribers to a speed level above 50 Mbps and thus enjoy better experience in communication, entertainment and business. 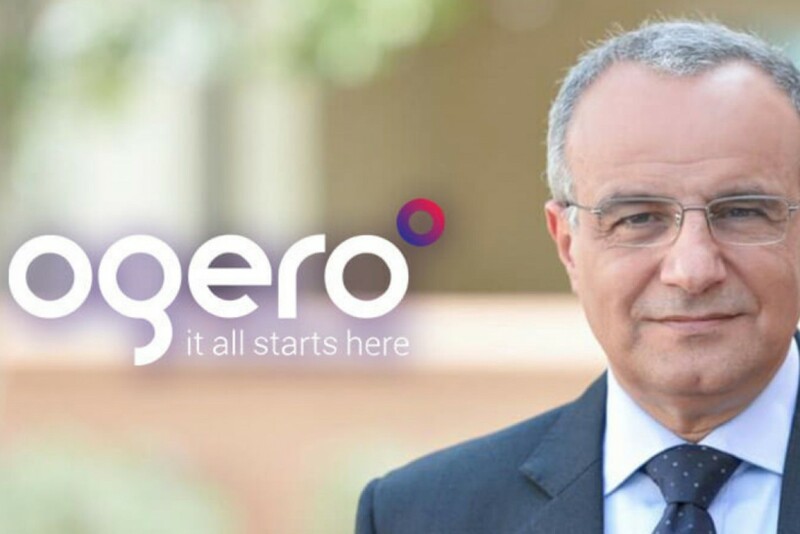 In line with Ogero's plan to cover all Lebanese territory with high speed connectivity, remote regions which were still connected to the older WLL technology due to absence of DSL network, started being transferred progressively to the modern long term evolution (LTE) technology. This wireless based platform will take both voice and data services to a new standard of quality with speeds reaching up to 225 Mbps. In parallel with the fiber optic deployment across the Lebanese territory, Ogero launched a bold plan to start switching ADSL ports to VDSL in numerous regions. This switch in technology will open speeds up to 50Mbps to users within a 500 meter radius of the central office. The above gives you an idea of the magnitude of the change we are instilling in the sector and allows us to say with all credibility that Ogero is indeed "connecting the nation". Competition with ISPs can be challenging, especially that you were facing the problem of illegally operating connections. How is Ogero handling this competition? Who is controlling internet prices, including Ogero's prices? The only way to handle such a fierce competition is by providing the best quality and reliability of the internet service, thus launching the FTTX project nationwide. As for the prices, regulations of the ISPs and tariffs, they are the prerogatives of the General Directorate of Investment and Maintenance in MoT, including the tariff provided by OGERO. Local ISPs claimed in the past that they were leasing download capacities from international satellites to make up for the local E1 shortage. Can you share your insights regarding this issue? In general, the use of the satellite for internet service is for redundancy purpose and for widespread remote areas where the necessary infrastructure is difficult to deploy, but not as a main way to provide the internet service. ISPs used all possible ways to gap the E1s shortage, including but not limited to the download from international satellites. Such capacity have several limitations, such as high cost for a limited bandwidth and latency due to the propagation from earth to satellite. Since you have opened the E1 leasing line, do you still have enough capacity? OGERO and MoT have ample capacity over redundant submarine fiber optic cables. For instance IMEWE is currently equipped with 1.5 Tb/s where the usage is currently around 25%. Furthermore, OGERO is upgrading all its network component (be it local or International) in order to cater any future demand. Ogero deployed LTE stations in 2017. Is investment in LTE necessary in the context of fiber deployment? Is it dedicated to end users or only a short term investment to transfer data between Ogero stations? The LTE-A that OGERO/MoT deployed are in the remote areas where the network (ducts) infrastructure is not available and thus OGERO cannot deploy fiber in these areas unless the ducts are available. In order to cater to the demand for these areas very quickly and based on the equal treatment for all the customers, OGERO/MoT deployed a wireless infrastructure that can provide all the services like the FTTx to the end customer, therefore the naming of WTTx (wireless to the X). The fixed wireless provided to the end users in these areas can provide internet services for the customers up to 225 Mb/s. Since Ogero set its mission to connect the nation across the territory and not limit itself to high-density cities, it became imperative to adopt a multitude of technologies to adapt to the changing landscape between one region and the other. People have been waiting for years and we cannot ask them to wait another century. For that purpose, LTE-A came as a high quality data and voice replacement for end users instead of the out dated WLL which covered regions with no DSL network accessibility. LTE-A provides these users with speeds reaching 200 Mbps with deployment happening as we speak in all WLL equipped regions. Achieving a complete FTTH network implies the deployment of fiber into every single home or building which is not realistic at this stage. For this reason, we called the project "FTTx" because it combines fiber to the cabinet, fiber to the office and fiber to the home. In parallel, the engineering team managed to identify all the upgrades required for the core network to support the increase in the demand for capacity. We implemented seven projects related to the core network and the different layers of transport. We are almost done with those upgrades which will allow us to engage with the new project that will add additional pressure. Delivering very high speed internet packages will mean that demand on data packages and international capacity will grow.